"Some day the piecing together of dissociated knowledge will open up such terrifying vistas of reality, and of our frightful position therein, that we shall either go mad from the revelation or flee from the deadly light into the peace and safety of a new dark age." "She took a deep breath. Agnes began to draw a stronger chalk circle with a steady hand. If this evil was coming to Arkham, it was an evil she had fought before, a long time ago. She needed to be ready for it again." The truths you learn you can never truly unlearn. Instead, they change you. But what changes will they effect? Will they send you spiraling into despair? Will you go mad? Will you rave to your neighbors, bellowing incoherently about the unseen forces that you have witnessed but that they cannot possibly comprehend? Or will you summon your strength and fight to secure a place for humanity, even in the face of the unfathomably powerful beings from distant worlds and dimensions beyond our own? 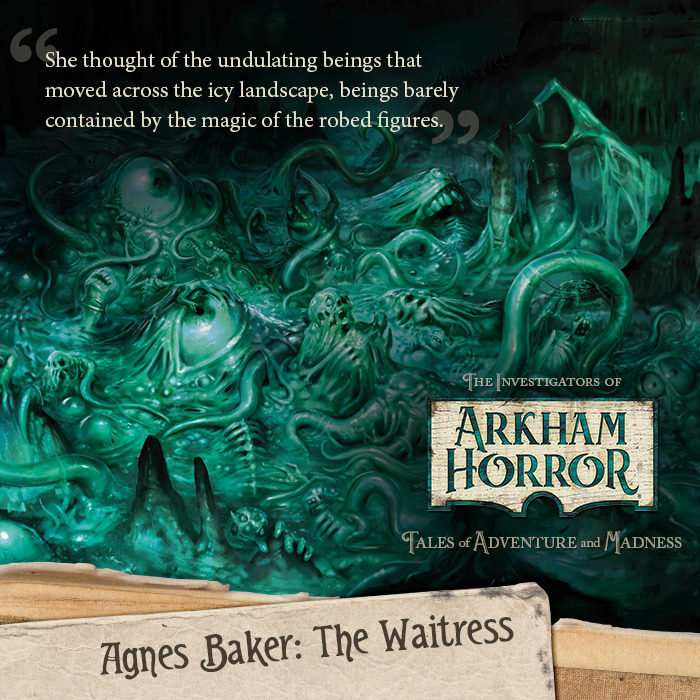 As you might expect, you'll find that the 264 full-color pages of The Investigators of Arkham Horror are full of terrifying truths, desperation, madness, and unfathomable entities from beyond. In fact, these are themes trod and retrod by nearly every book or work of fiction inspired by the eerie, supernatural horror stories of H.P. Lovecraft. 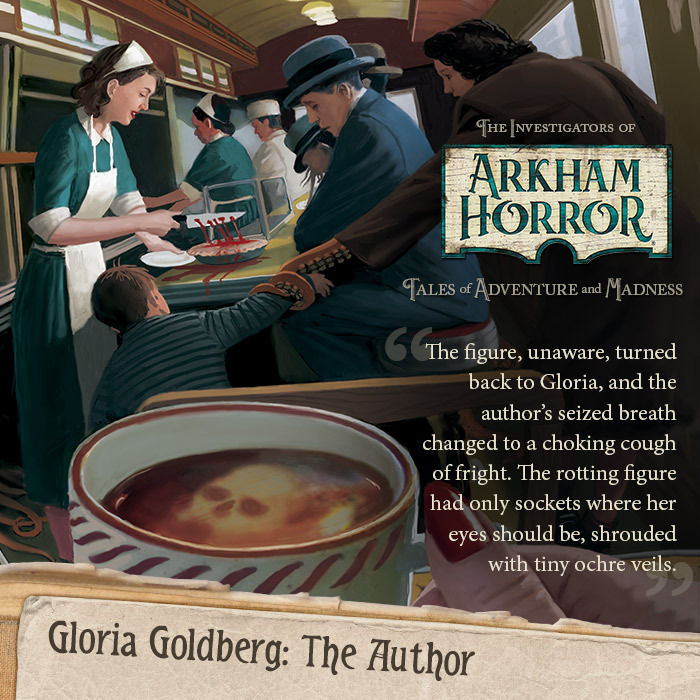 But as the definitive art and setting book for the Arkham Horror Files universe, The Investigators of Arkham Horror veers away from most other works inspired by the Mythos. For each point at which the Arkham Horror Files universe intersects the Lovecraftian Mythos, there are others where it diverges. Lovecraft wrote at a time that the world was moving through monumental industrial and geopolitical changes. Science was coming to terms with the theories of evolution, the discoveries of distant galaxies, and the idea that the universe was far older than anyone had previously thought. Humanity's place in the universe was rapidly shrinking. Lovecraft's eyes were opened to the idea of an unknown universe. The idea that humans were central or important to existence was almost laughably fragile—constructed by humans as a screen meant to preserve their own sense of self-worth in the face of a cruel or unfeeling cosmos. And what if we weren't the only intelligent entities? What if there were others? The fear of the unknown pervades Lovecraft's fiction, it's infused in the larger Mythos, and it runs pell-mell through the Arkham Horror Files universe. 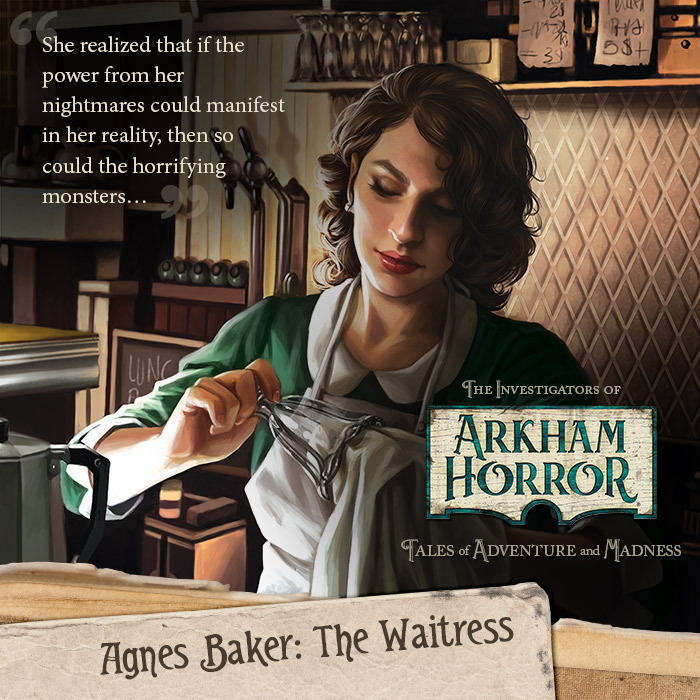 But where the characters in most Lovecraftian stories typically respond to their discoveries with a growing sense of futility, the characters in the Arkham Horror Files universe experience a growing sense of need. They must fight, race, explore, and do whatever it takes to defend humanity's continued existence, even if there are no permanent solutions. This is why the Arkham Horror Files setting book is presented as a collection of short stories: the way that its heroic investigators rise to meet the challenges before them represents the single most important divergence between the Arkham Horror Files setting and the Lovecraftian Mythos. There's a chance the investigators may go mad, but there's almost no chance they will "flee from the deadly light [of their revelations] into the peace and safety of a new dark age." No. The investigators of the Arkham Horror Files universe are compelled to act. And by sharing their stories, The Investigators of Arkham Horror offers you a window into the heart of the Arkham Horror Files universe. When the waitress Agnes Baker recognizes that her terrifying visions may somehow connect her to another reality, she busies herself with finding a way to confront the evils she's seen. When the astrologer Norman Withers observes something moving between the distant stars, he redoubles his work so that he can come to an understanding of what he's witnessed. And when the farmhand Hank Samson and his Pa find their cows bloodied and torn, they grab their shotgun and Springfield and pursue the unseen predator into the hills. If the fear of the unknown is the strongest of the themes in Lovecraft's fiction, the second strongest may be the inevitability of entropy. Not only is the universe vast beyond comprehension, but the myriad forces it contains are likely to undo that ordered portion of reality that is your life. Since we've already established that the heroes of the Arkham Horror Files setting are the sort of people who refuse to lie down and accept the inevitability of entropy, we recognize that conflict is inevitable. The Arkham Horror Files setting is defined by its struggles. Not only is it defined by its heroes' willingness to join the ongoing struggle for humanity, but also by the relatively optimistic tenor of their struggles—optimistic, at least, within the context of the Mythos. After scientist Kate Winthrop survives her confrontation with a Mi-Go, she draws upon the experience to finally unlock the true potential of her mentor’s device. When rookie cop Tommy Muldoon encounters a tremendous bat-winged creature with a gelatinous belly, he's terrified, but he also decides the moment is his chance to become a hero. There is yet another way, however, that these struggles distinguish the Arkham Horror Files setting from the standard Mythos, and that's in the way they're presented. At its heart, the Arkham Horror Files universe, as reflected in The Investigators of Arkham Horror, is a fusion of pulp action and Lovecraftian horror. Tommy Muldoon confronts an otherworldly horror with his rifle. Gangster Michael McGlen barely breaks his rhythm when his "business associate" is suddenly dragged into the Miskatonic River; he simply grabs his gun and fires. You'll find forbidden tomes and cultists and Ancient Ones, but you'll also find heroes willing to arm themselves with shotguns and tommy guns and go to battle. And there's a touch of noir to their approach, as well. Envision your classic, hard-boiled detective movie in black-and-white, throw in some cultists and the threat of a many-tentacled creature from another dimension, and you'll have something close to stories like that of private eye Joe Diamond and ex-convict "Skids" O'Toole. 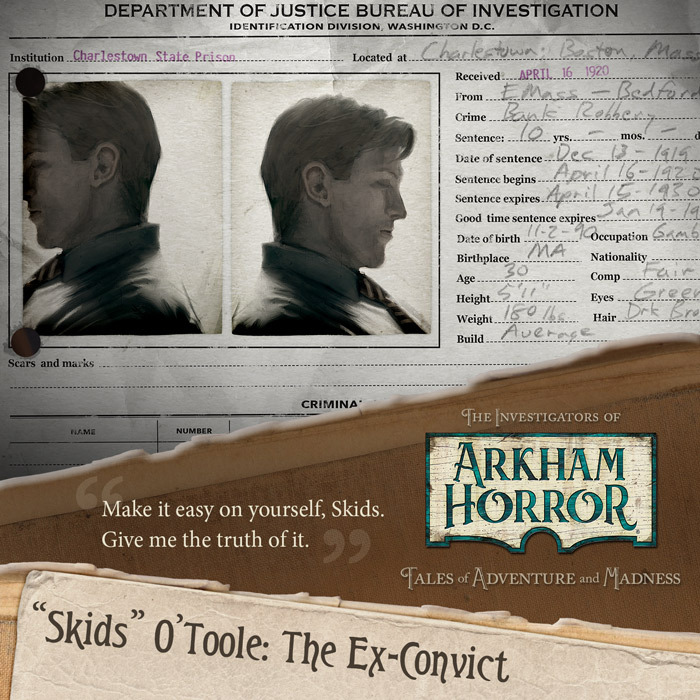 The fact that Joe Diamond and "Skids" O'Toole can both be heroes illustrates another way that the Arkham Horror Files universe departs from the Mythos. 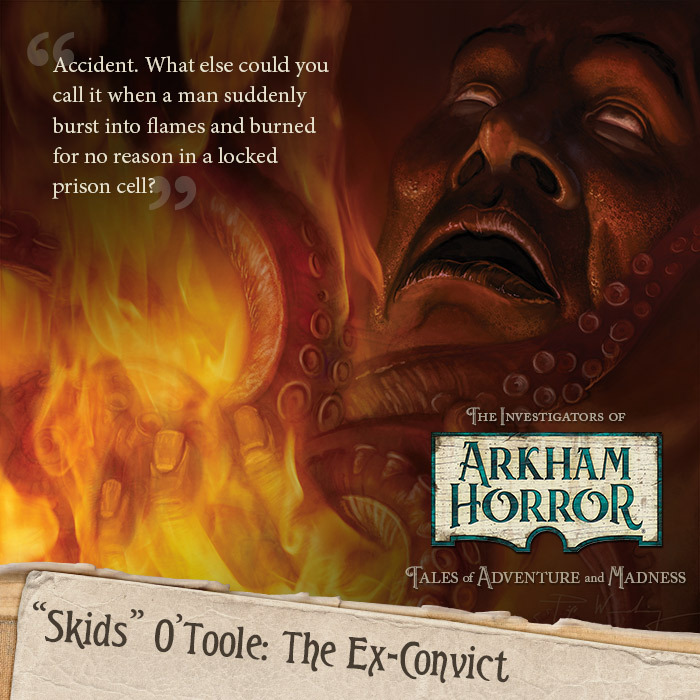 In the Arkham Horror Files universe, people are not defined by their stations in life, their genders, races, or creeds; they are defined by the ways they respond to the terrible truths they uncover. If they shrink away from what they have seen, they are cowards. If they seek to use their newfound knowledge to gain personal advantage, they may become villains like Carl Sanford, the head of the Order of the Silver Twilight. But if they try to protect others from the threats they've realized—even if just by first protecting themselves—they may become heroes. This allows the Arkham Horror Files universe to more fully appreciate the diversity of all the different men and women who work against the evils of the Mythos. 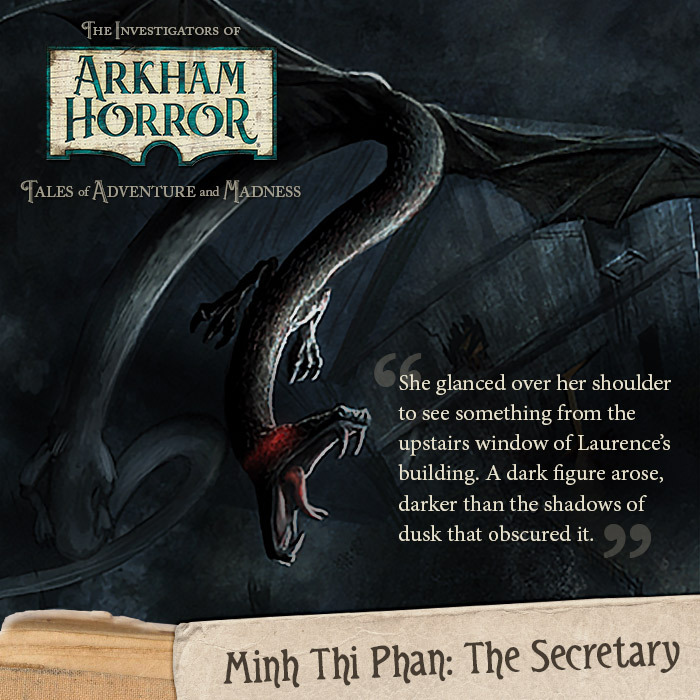 While many of them reside in Arkham, the threats of the Mythos span the globe, and The Investigators of Arkham Horror follows them to the streets of Shanghai where Lily Chen trains to confront the dark spirits and to the ship on which Akachi Onyele sails from Africa to America. 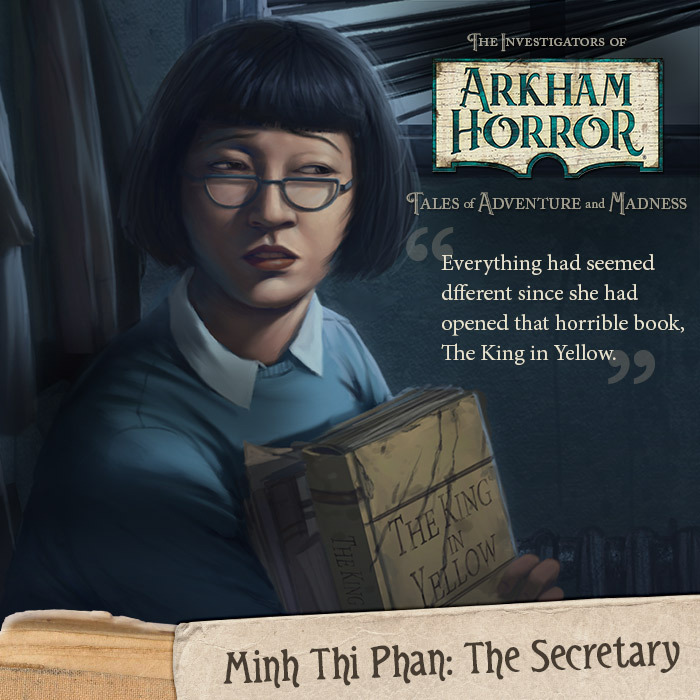 Even in Arkham, The Investigators of Arkham Horror reflects the diversity of the Arkham Horror Files universe by following the Vietnamese immigrant Minh Thi Phan as she pursues the connection between the play The King in Yellow and the death of her former employer. There are still other, subtler ways that the Arkham Horror Files universe moves away from the standard Mythos. These include the use of magic, the aims of cults like the Order of the Silver Twilight, and the nature of the conspiracies running through different aspects of society. 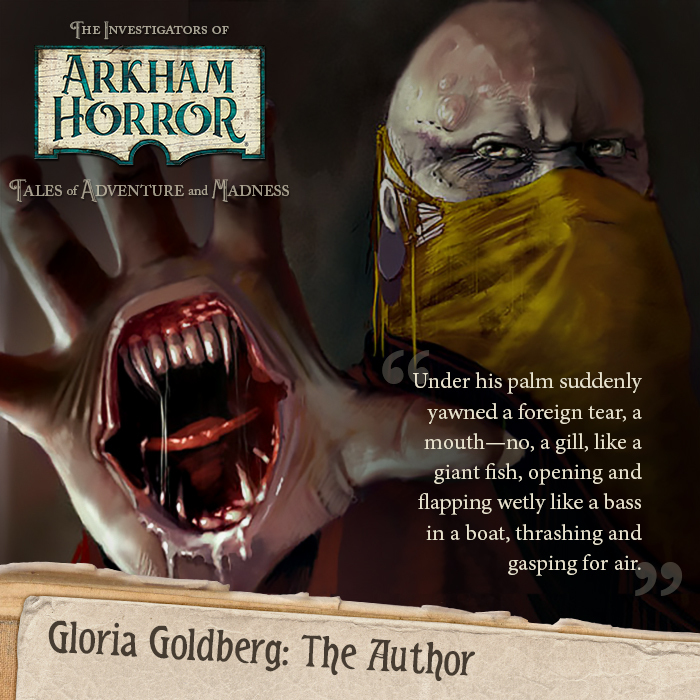 But for all the intersections between the Arkham Horror Files universe and the Lovecraftian Mythos—and for all the differences between the two—you'll find examples in The Investigators of Arkham Horror that will better help you understand the characters you play in your favorite Arkham Horror Files games. After all, why would a federal agent like Roland Banks or a psychologist like Carolyn Fern respond to sudden revelations of previously unfathomable terrors by pursuing heroic courses of action? Their stories help you understand them; they help you understand who these characters are, where they're coming from, and how they might work to defend humanity's legacy. There are secrets, too, of the Ancient Ones and their cultists in The Investigators of Arkham Horror, but there's a reason the book follows the stories of its fifty-two investigators. 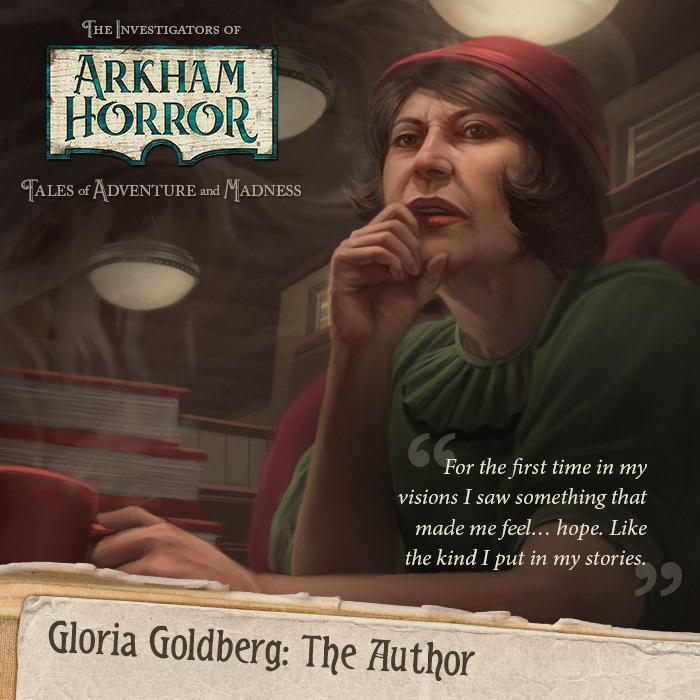 Their stories—the ways in which they are changed and the ways they respond to the threats presented by arcane knowledge and extra-dimensional creatures—those stories are the rapidly beating heart of the Arkham Horror Files universe. You can soon delve into the secrets of these investigators and the Arkham Horror Files universe. 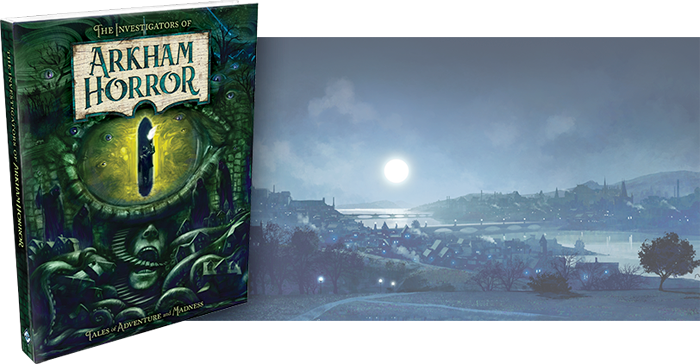 The Investigators of Arkham Horror is scheduled to arrive at retailers early next month.